submarine cables (such as the interconnector between France and England). networks to which they are connected. Figure 25.5. The celebrated little square. 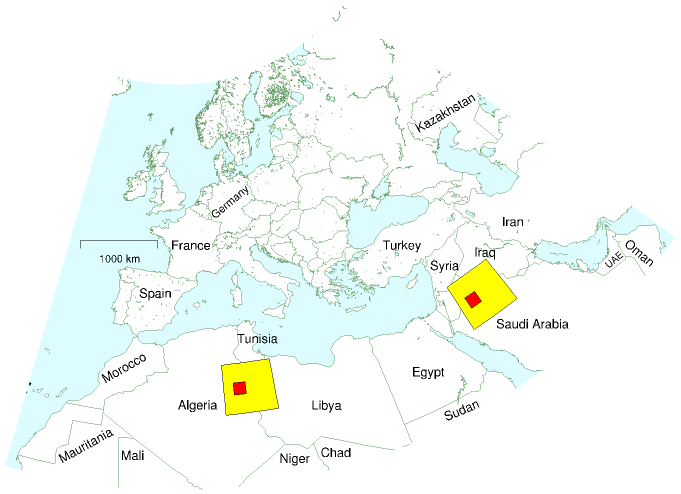 This map shows a square of size 600 km by 600 km in Africa, and another in Saudi Arabia, Jordan, and Iraq. Concentrating solar power facilities completely filling one such square would provide enough power to give 1 billion people the average European’s consumption of 125 kWh/d. The area of one square is the same as the area of Germany, and 16 times the area of Wales. Within each big square is a smaller 145 km by 145 km square showing the area required in the Sahara – one Wales – to supply all British power consumption.